Maximize your tax deductions and credit. TaxACT® makes preparing and e-filing your federal and state tax returns unbelievably easy. It’s done with 100% accuracy. Just ask millions of satisfied customers. A step-by-step interview guides you through the process, automatically filling in the appropriate IRS forms while keeping track of your refund. TaxACT® makes preparing and e-filing your federal and state tax returns unbelievably easy. It’s done with 100% accuracy. Just ask millions of satisfied customers. A step-by-step interview guides you through the process, automatically filling in the appropriate IRS forms while keeping track of your refund. It’s easy to maximize your deductions and credits – from mortgage interest and charitable contributions to medical and educational deductions, you’ll get the tax breaks you may be entitled to – hundreds in all. With E-file, you can even get your refund in as few as 8 days! Perfect for first time users. Even includes video tutorials. Complete your Federal and State taxes in 4 easy steps. Step-by-step interview guides you through automatically filling in the appropriate forms. Import data from 2011 tax return prepared with other software. Get the mortgage, medical, moving, educational and charitable donation tax breaks you may be entitled to. Federal data automatically flows into your State return. Use E-file to get your refund in as few as 8 days. Checks for errors and missed tax savings opportunities. Alerts you to possible mistakes. Boost tax savings using Deductions, Credit and Income Examiners. Stock, bond & mutual fund import. 35+ Life Events provides help for life changes like a new home or new baby. TaxWatch helps you lower next year’s taxes. 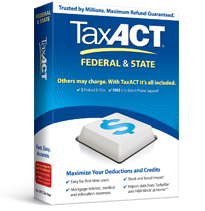 Keeps you current with the latest applicable IRS and State tax forms and laws. Check your Federal E-file status with our free iPhone/Android app.